Experimente uma incrível vista do amanhecer no topo do pico mais alto de Maui durante este Mt de 7 a 8 horas. Passeio ao nascer do sol de Haleakala. 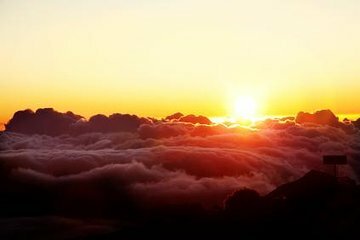 Viagem com um guia para o cume deste vulcão maciço para testemunhar o alvorecer laranja e vermelho de um novo dia situado entre as nuvens, apreciando a beleza sublime de uma visão que inspirou o grande Mark Twain literário. Esta excursão ao nascer do sol em Maui também inclui transporte de ida e volta, café da manhã continental e taxas de entrada. 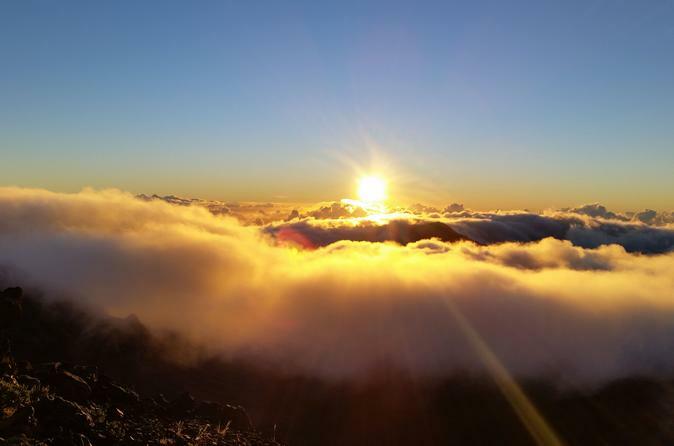 Comece o seu dia em Maui com uma vista deslumbrante do nascer do sol da ilha do topo de seu pico mais alto nesta excursão de alvorada ao Monte Haleakala. Esta experiência excepcional do nascer do sol é a certeza de ser um destaque de sua viagem a Maui. Comece sua viagem no escuro da madrugada com uma picape no seu hotel em Maui. Em seguida, você continuará em um micro-ônibus com ar-condicionado em um passeio panorâmico pela ilha, passando pelo distrito de Kula, pelo Puu Ulaula Overlook e pelas raras plantas silversword de Maui. Continue com uma subida constante em minibus até Haleakala, subindo mais de 10.000 pés (3.000 metros) acima do nível do mar. As vistas de cima são nada menos que espetacular. O escritor Mark Twain, ao visitar o pico em 1866, escreveu que o vulcão era "o mais sublime espetáculo que já testemunhei e a memória dele permanecerá comigo sempre". Chegue ao cume e acomode-se enquanto observa os primeiros raios do novo dia se arrastando lentamente pelo horizonte distante. Logo o céu se enche com o brilho majestoso do novo dia, e os raios quentes de luz rastejam através da ilha de Maui, iluminando a terra abaixo. É uma visão que você vai lembrar por muitos anos. No final da sua experiência de nascer do sol pela manhã, você receberá um retorno no seu hotel em Maui, cansado, mas emocionado com sua incrível viagem pela manhã. This tour was one of the best experiences I’ve ever had!! The sunrise was amazing. It was totally worth getting up at 2:20am. Our tour guide Nettie was amazing! She was so inspiring and full of wisdom. Breakfast was pretty delicious too. Preston was full of wonderful information and humorous stories- which made this early morning tour enjoyable as well as beautiful! This was a great tour and I appreciated that they picked us up at our hotel. I think in the future I will skip the breakfast. Is wasn’t good and there seemed to be a lot of wasted time on the way back. Could have been back around 10 without breakfast. It was beautiful and well worth getting up for a 2am pickup! The tour guide was very friendly and knowledgeable! Recommend anyone going to Maui to take this tour. At the top of Haleakala, it can still be chilly in the 40's in June. Dress warm and bring a cap. The sunrise views is awesome, peering through the clouds below you. For those with a rental car, you could go back a different day for a hike around the summit. Bring enough water if you are going for the hike. I am torn about how to review this excursion. Let's start with the incredible sunrise. The views are amazing and worth every second of the 2.5 hours it takes to get to Haleakala. It's quite the scene to watch the sun come up over those clouds at 9,000 feet. However, the rest of the trip left much to be desired. Our guide never fully communicated the plan for the day, which led to a bit of confusion. After the trip up the volcano bring Dramamine if you get car sick it took entirely too long to get down. We made two stops on the way down the volcano, one of which was 20 minutes at the visitor center which hadn't opened yet. Then we made our way to breakfast which was at an aging public golf course. At this point, everyone was tired from waking up at 2 AM and ready to go home. The food was pleasant but in retrospect I would have rather saved the time and just gone straight home. Overall, it's hard to be upset with the trip as the views were just incredible! However this 9 hour trip 2 AM to 11 AM would have been better as a 6-7 hour trip. If I were to do it again, I would just drive our rental car up the volcano and pay the entrance fee to the park and save the rest of the money. I'm not sure you really get the bang for all the bucks you spend. Our driver was fantastic. Amazing early morning. Food good too at the golf course. Pre snacks in the early AM good too. Driver totally informative. A self 'funk and wagnal' encyclopedia of knowledge about the Islands in general. Love the driver.